The most affordable and sellable wagons for kids are fall in this price range. If you choose plastic wagon, you’ll probably notice the lightweight material, ease of cleaning and the affordable price are the key contributing factors. As you browse through the list, you’ll notice immediately Step2 has almost dominated the plastic wagon under $100. You’ll be glad to know the wagons by Step2 are made in USA. Some people may prefer the old time metal classic red wagon which still sells by Radio Flyer even after 100 years. Do note that the maximum weight capacities for most of the plastic wagons are 75 lbs due to its material and size. These wagons are suitable for smaller kids from 2 to 4 years old. The Neighborhood Wagon is a basic and classic design by Step2. This deep red wagon can comfortably carry up to 75 pounds, or 2 small children. Because of its durable design, you can be sure to rely on this wagon for several years to come as long as you don’t over-load it. Nice perks include cup and snack holders and a handle that folds under the wagon for easier storage. Besides that, this wagon is made for mainly sitting and doesn’t offer much in terms of additional storage. If you want a sun canopy it is unfortunately unclear whether or not there are attachable canopies available from Step2. For its price, you’ll have a modest wagon. Be careful to not over-load it because there have been many customer complaints of their wagons breaking. Other than that, the Step2 Neighborhood Wagon will have no problem hauling a child around the block or to the grocery store. Lots of kids like its design and enjoy the Step2 Neighborhood Wagon. The price is just right to get one for your kids. Rest assured you will get some pretty nice features with this ride. You get seat belts for little ones to ride securely and 2 seats that are fold-able to create a flatbed. A cute door on the side is there for the kids to easily go in and out of the wagon. Cup holders for both the kids and adults are great for storing drinks and snacks. A sun canopy is also provided for UV protection. The only thing you might find undesirable about this wagon is the wheels that don’t work too well on rough terrain as well as on soft sand. Aside from that, this wagon offers great features for the price it comes for. It’s got a durable, long lasting build so you and your kids can enjoy this wagon for a long time. To look for wagons for soft sand, check it out: beach wagons with big wheels. Another wagon brought to us by Step2 is the Wagon for Two Plus in Blue. 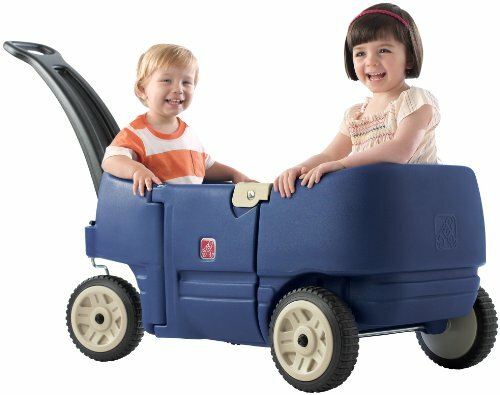 It’s a charming blue wagon with a side door to make both entering and exiting easy for small children. Step2 Wagon for Two Plus is the most affordable wagon you can find. And this is a nice quality wagon that will last. Aside from the side door, another feature this wagon has is the ability to fold the handle under for an easier time storing this wagon at home or in the garage. There isn’t much else to this wagon since it’s pretty bare bones, but it gets the job done easily. You can be sure any child is secure in this wagon, Step2 ensures it provides your child with a safe environment. If you don’t mind the most basic of wagons, this would be a great choice for the family. While the Step2 All Around Wagon is one of the cheaper wagons we’ll be going over on this entire list, it provides some pretty neat features. Especially when you consider the price of this wagon, you’ll be surprised at what this wagon can do for you. Some of the more impressive features of the All Around Wagon include a small, rear storage bin for snacks and personal belongings and a side door entrance. Additional features include foldable seats to create a flatbed and cup/snack holders. Like many of the other wagons available for under $100, you won’t want to use this wagon anywhere else besides the sidewalk. 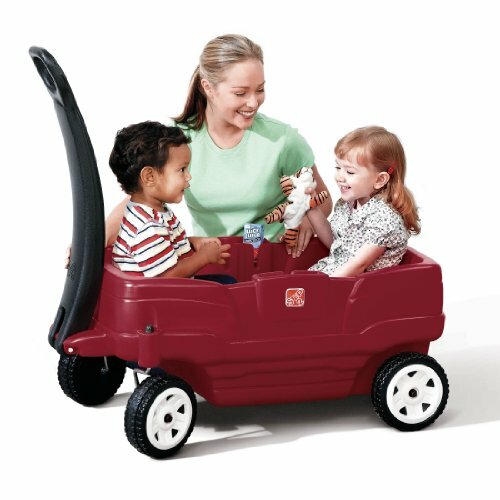 This wagon is overall a very cute and perfect for 1 or 2 toddlers to take a ride in. As you can probably tell, the Step2 brand specializes in providing families with low cost wagons that provide a comfortable experience. The Radio Flyer Classic Red Wagon is the traditional wagon that every parent remembers from their own childhood. 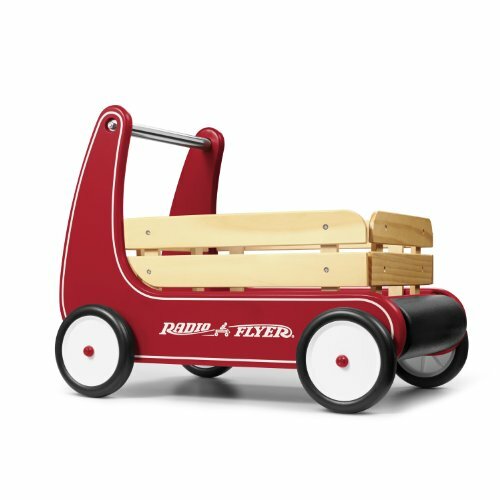 You get to enjoy the high quality Radio Flyer is known for and your child or children will definitely appreciate it’s charming red color and metal structure. 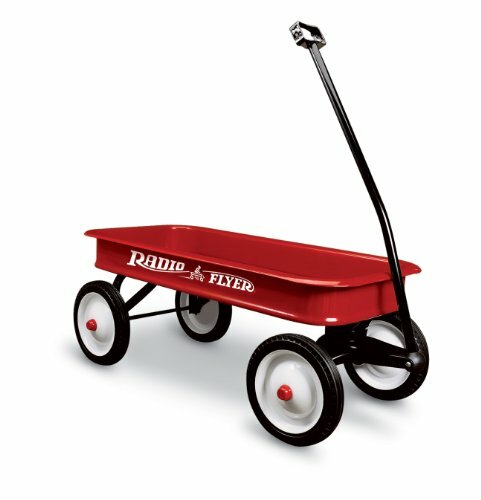 Radio Flyer wagons are some of the sturdiest and most durable wagons you’ll find on the market. This wagon is straight forward. There are no accessories or special storage, which doesn’t affect any of the wagon’s functionality. If you would like, you can purchase a sun canopy to fit on this wagon. This is a great wagon if you care more about a long lasting quality than a ton of fancy features. 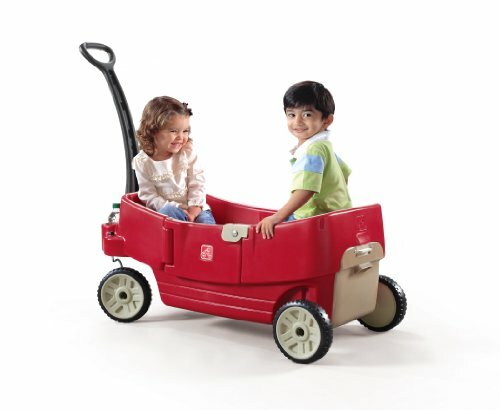 Undoubtedly, this Classic Red Wagon is the most adored wagon by families across the United States. This willow green wagon by Step2 is essentially the same wagon as the Step2 Wagon for Two Plus in Blue. It comes with a side door entrance for easy and quick entry and exit, a handle that folds underneath for storage, and two seat belts for safety. There is also a storage compartment under the front seat. You may also opt for an additional Tag Along Trailer for more storage. 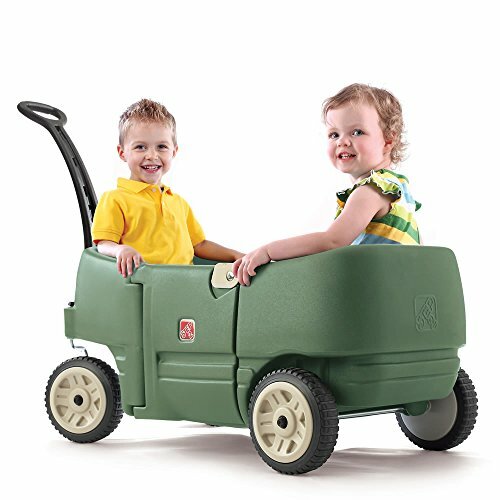 Since this is an all plastic wagon, the recommended age is under 6 years old with total weight capacity below 75 lbs. This is one of the top selling, cheapest models in the pull along wagons category. Pick this wagon up while it is still considered cheap and we’re sure the kids are going to enjoy the ride. 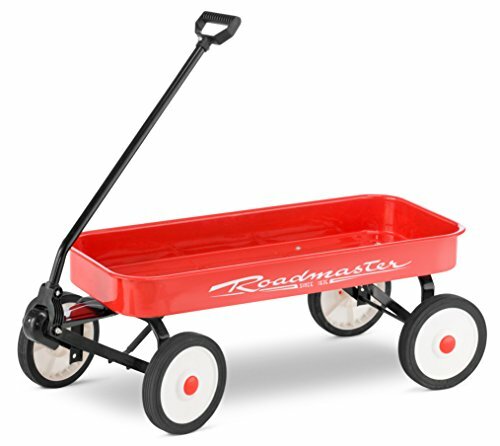 Essentially, the Pacific Cycle Roadmaster is a cheaper version of the Radio Flyer Classic Red Wagon. This wagon features a red steel frame and 8” tires. If the size of the tires is important to you, these are 2” smaller than the Classic Red Wagon. Pacific Cycle does a great job at emulating the Radio Flyer classic. Again, there are no “frills” and extra features, just a wagon the kids will love. 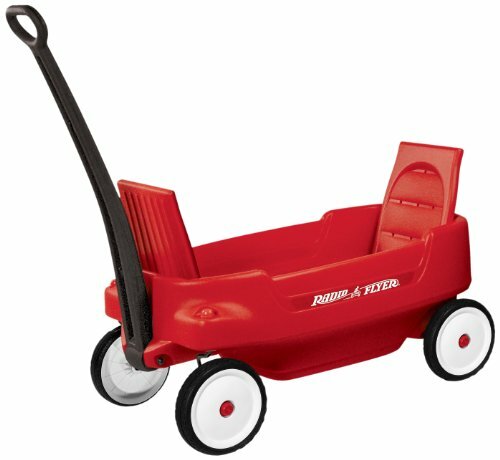 While this is cheaper than the Radio Flyer wagon, if quality is most important to you, it would be better for you to choose the Classic Red Wagon instead. However, despite its cheaper price, the ratings is steady at 4.5 stars. You’ll be surprized that it holds up to 250 lbs. This wagon is an interesting choice to go with since the design has been discontinued by Radio Flyer. Being a unique design, this wagon has a plastic body that features ample back support to its passengers. It can comfortably seat up to 2 small children for a stroll around the block or to the park. You can be sure your child is riding safely with the seat belts this Pathfinder Wagon provides. Aside from having the ability to fold the seats and handle down, this wagon is fairly basic. Order one of these rare wagons while it is still available and you’ll be happy with the value you get for the price. 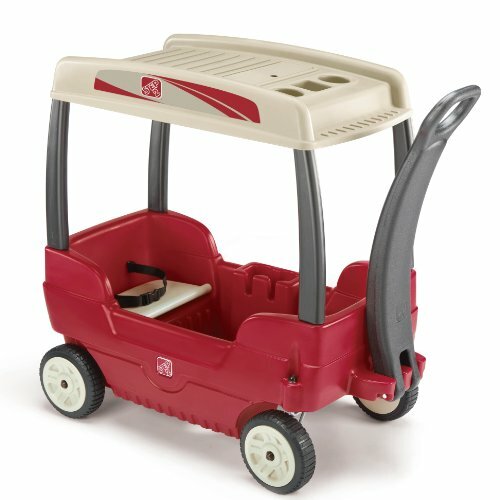 This Step2 Canopy Wagon has a build in sun canopy and can hold up to 75 pounds. You also get some other features like safety seat belts and a few cup holders for your convenience. There is additional storage underneath the seat of the wagon so you can bring along snacks with ease. 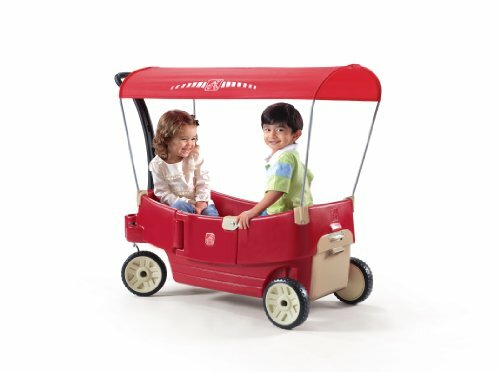 For its design and affordability, you and your child can enjoy the Step2 Canopy Wagon. While it has minimal features, it does a great job at providing kids with comfort, and parents with ease of use. A wagon that stands out from all the others we’ve gone over, the Radio Flyer Classic Walker Wagon leaves the traditional wagon handle for a walker handle. Now little ones who are learning how to walk can use this wagon to help develop motor skills and muscles. This is not your typical all-terrain or folding wagon because it was specifically designed for your little one to learn how to walk. The design is safe for your home and won’t damage walls or furniture. For a low price, you can help provide your child with a more comfortable environment to learn how to walk.